Growing up with classic games like Sim City and other open-ended god type games whereby you create something from scratch whether that be a City, a hotel or whatever, I was very happy to hear about a game where you could build your own Jurassic Park. 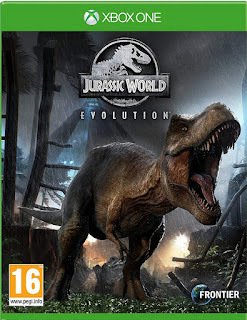 In Jurassic Park Evolution you have your own Jurassic franchise, and you start with one Island whereby you can build your own park, but it is not that easy, you have to send out people to find fossils, which in turn you collect DNA and then when you have enough you can create a dinosaur. But this is not just about creating dinosaurs, after all you have a park to run, and you have 3 parts that will help grow and improve your park, Science, Entertainment or Security. Science is pretty obvious, Entertainment can be anything from building a gift shop for park visitors to use, or a big hotel, or even viewing areas. Security is all about protecting your park from the inevitable disasters that make the game even more of a challenge, whether that is a bad storm, or dinos escaping and attacking people. As you bioengineer dinosaurs you can also manipulate their DNA to give them new and improved traits, that might be a new colour skin which makes the dinosaurs more attractive to visitors, or maybe a better attack of defence level. Throughout the game you have challenged to compete which earn you money. The challenges can include simple things like creating a new dinosaur, or allowing a dinosaur to escape from its habitat and then deal with the chaos. There is two main modes to play, the "career" mode whereby you start off on one island with one park, and then you can expand to another island and so on. Or there is the challenge mode whereby you are put in situations and and have to complete specific tasks to beat the challenge. This game is so much fun, and if you like these types of games you will love this. You really do get a sense of learning from your mistakes, and sometimes starting fresh and putting into practice everything you have learned really is rewarding when you see how much better you do 2nd and 3rd times around. Plus you really can get close up to the action, you can fly helicopters, drive ranger cars and so on. And you can also now get new premium downloadable content pack from Frontier and Universal featuring all-new locations, dinosaurs, challenges and a brand new Jurassic World story starring BD Wong as geneticist Dr. Henry Wu. Check out the trailer for that below. I happily give this game a 9/10. I loved it. Buy now on the following formats. First 2 links open in a new window and go to Amazon.